"Travis Bernhardt’s performance actually prompted an audience member to exclaim, “I’m all sweaty now!” after his final card trick on Sunday afternoon. This was because after much anticipation…the trick did not actually work! This illusionist, luckily, is not only a great performer but is also charming and very funny. The trick was repeated with double the anticipation in the crowd as well as, seemingly, in Bernhardt himself. The audience was tense and the heat was rising in the air… to the climax of…yes! a successful and truly amazing peak to the show. 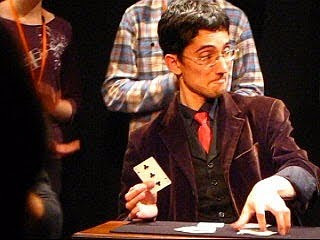 This magician exudes a quirky humour while filling the venue with his personality. 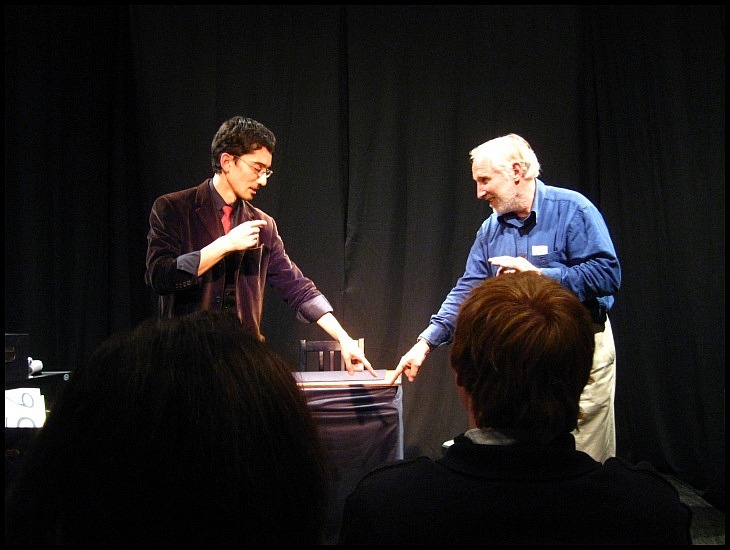 Go and see some reality bending illusions and laugh with fellow Fringer’s at this entertaining and energetic performance." Update: Another review, by "A Chick in Van Blogs About Stuff", which includes this quote: "Go see this show now. And sit in the front row. Or we’re not friends any more. Not even Facebook friends. That’s harsh i know but i am doing it for your own good. Like when The Henderson’s told Harry they no longer loved him." And another review, a little bit of work to find it so I'll quote the whole thing (but if you want to see the original, at the time I write this it's available at the Urban Pie website in their "latest issue"): "I saw this on a whim during a break between two other shows I had scheduled. As it turned out, this was the best show I saw all day. Travis Bernhardt is a magician and “Things That Never Happen” is a delightful performance of parlor magic tricks set in the intimate space at Origins Coffee. Bernhardt is a charming and skilled performer, even if his tricks had failed, I still would have been entertained by his clever banter. But his tricks are amazing. 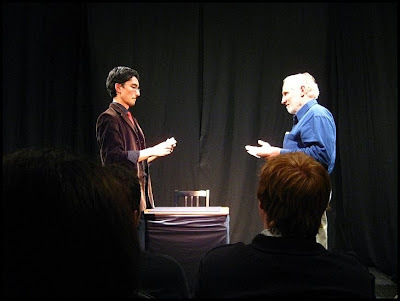 On several occasions, people in the audience gasped audibly (I was one of them). The card trick at the end is simply mind blowing. See it; you will not be disappointed." A group of us attended your show "Things that Never Happen" on Granville Island during the Fringe Festival and we were in awe the entire show. Your wit and humour were an added bonus to your amazing magic. If you have the chance to see Travis you're in for a treat.